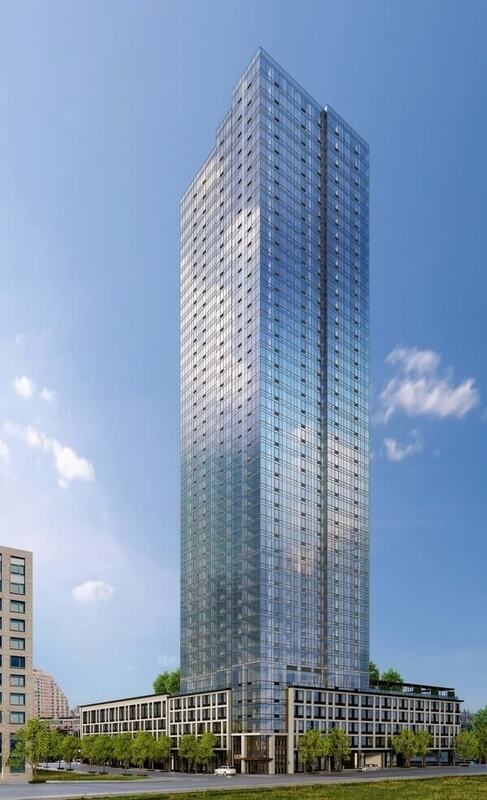 Nearly two years ago, ground was broken for a 45-story, 510-foot-tall residential tower at 33 Park Avenue in Jersey City. Since then, a lot has changed, including the street name. Now, the project is nearly complete. The new address is 33 Park View Avenue, just north of the Morris Canal Basin and adjacent to both the Paulus Hook and Van Norst neighborhoods. The almost-finished development also now has a name – Vantage. Fisher Development is behind the 448-unit project, with S9 Architecture responsible for the design. There will be 56 studios averaging 559 square feet, 310 one-bedrooms averaging 809 square feet, and 82 two-bedrooms averaging 1,242 square feet. There will be 437 parking spaces, accessible to both residents and the public. Other amenities will include a 24-hour concierge, an outdoor zero entry swimming pool, and a cyber café. The building will open in May.